33°N shares research about the metro Atlanta region and is managed by the Research and Analytics Division of the Atlanta Regional Commission. Just how expensive is it to live in metro Atlanta? March’s Regional Snapshot examines one tool used to answer that question – the 2017 Annual Cost of Living Index (COLI) produced by the Council for Community and Economic Research (C2ER). Every quarter, C2ER coordinates with metro areas around the country to collect pricing data for a number of products and services to develop composite index scores, which can then be used to compare a given metro to another metro, or to the national average. Metro Atlanta is one of the most diverse regions in the southeast and this diversity is largely due to region’s ability to attract, retain, and grow immigrant communities. In some counties, over a quarter of the population growth is due to an increase in the foreign born population. 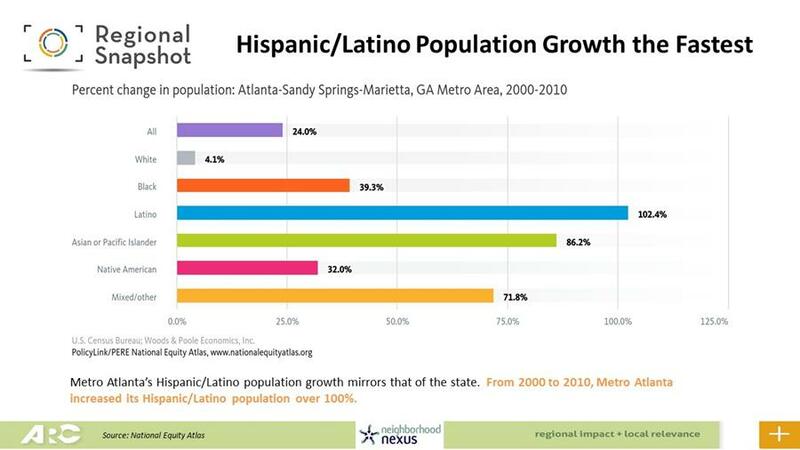 February’s Regional Snapshot explores the foreign born population in metro Atlanta, focusing on the largest contributor to our foreign born population growth – the Hispanic and Latino community. 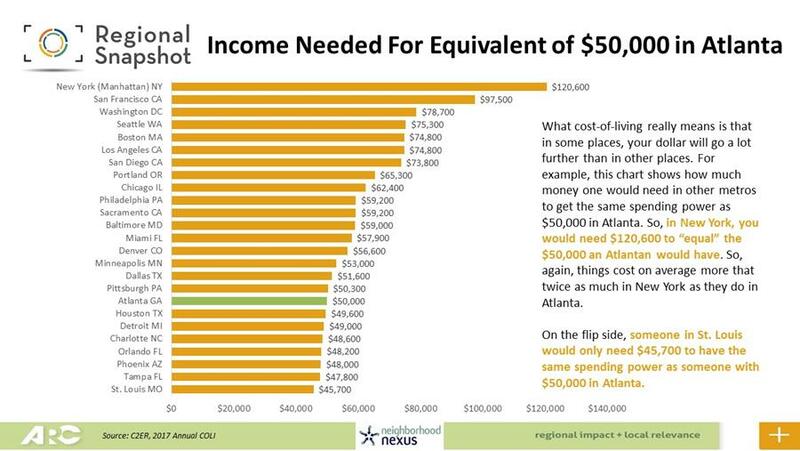 Did you know that only 4% of Atlantans born into the bottom 10th-percentile of income will make it to the top 20th-percentile in adulthood? That’s the lowest economic mobility rate in the country. This third post in the Equity Series examines economic mobility and it's relationship to education. ARC’s Research & Analytics Group is publishing a series of Special Features on equity over the next few months. Posts in the Equity Series will examine a variety of aspects of equity along with some of the key factors hindering the realization of this ideal in the Atlanta Metro region. The U.S. Census just released the most recent county population estimates for 2017. 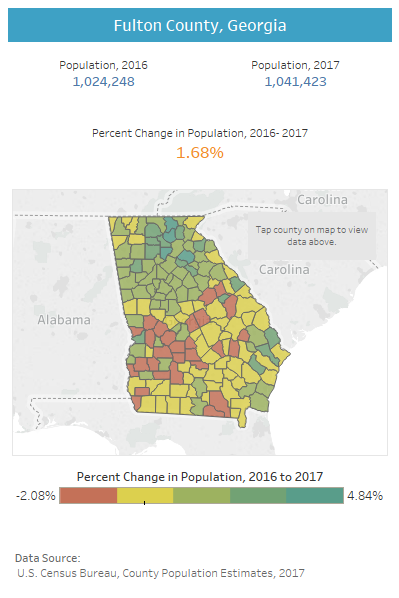 Based on this release, the state of Georgia’s population in 2017 was estimated to be 10,429,379 – representing a 1.12% increase or an additional 115,759 people from the previous year. Follow the link below to explore population change by county. Building off the special feature on population change, this Friday Factday looks at the two main drivers for population change: natural increase/decrease and net migration. Natural increase/decrease is determined by the balance of births and deaths. In addition to natural factors, net migration can add to, or take away from, an area’s population. Atlanta ranks third in population increase 2016-2017 across the twelve largest metro areas. Positive net migration has driven the largest share (60%) of this growth (at nearly +54,000 during the year). Friday Factday: Older Population Set to Outnumber Children in 2035 in the U.S.
Friday Factday: Informing Transit Discussion – What Does Metro Atlanta Speaks Say? You are receiving this email because you were previously subscribed to Regional Snapshot.